The Fantasy Football Fix Pre-Season Pack is AVAILABLE NOW. Beat the wait for "FPL" to relaunch and start planning next season's Gameweek 1 squad now using Fix's Predicted Player Prices. 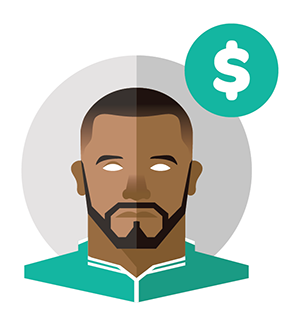 Create multiple FPL squads and tinker to find your ideal player combination for the start of next season, then apply fix stats to understand which player combinations will give you the most points. Last year I finished 279th. Last year it was 29 in GW 27. Being part of the inaugural Team GB & Friends Ryder Cup team - Shared Winners (19-19). Finishing 56th in Play Togga's Perfect XI. Scoring two 100+ scores (missed out on a 3rd ton by 3pts in GW8). Rising almost 1,000,000 places in the last 13 Gameweeks (but alas, left it too late). Lowest OR finish since 2007/2008. Falling outside the Top 1% (Final OR) after 4 consecutive seasons. Not winning any of my mini-leagues. Poor start (35pts / red arrow) and poor finish (35pts / red arrow). "Form is key, class doesn't matter" was the literal embodiment of the 2015/2016 Premier League season. Unfortunately, I didn’t realise this until it was too late. This was my toughest season to date. In many respects it was stop-start to say the least, one step forward two steps back. I finished with my worst overall ranking in 8 years and least successful since my debut season. Four consecutive Top 1% finishes (2012-2015) were blown out of the water by a final rank of 261, 424 which just about mustered a Top 7% finish. Such a finish was unacceptable in relation to my past ranks and pre-season expectations. To understand how I reached this nadir I need to look back at the 38 Gameweeks which formed my final rank. Glancing retrospectively at my Gamweek 1 team I was naïve in my thinking. I thought the proven likes of Rooney (with no rivals upfront) and Premier League winning Hazard (& Ivanovic) were musts. Sterling didn’t live up to his price tag and I relied on a 3-5-2 formation which over the course of the season haemorrhaged points from my team as shown in the stats. The team represented so-called class over rising stars. The fact I totally disregarded in-form Leicester players from April 2015 (except for Huth as he was cheap) only served to highlight the stale predictability of my team. I put down the first dozen Premier League results down to freakish results – unexpected away wins and a bit of bad luck. Four green arrows out of five by Gamweek 6 couldn’t mask the fact I was ranked 1.4M. I finally managed to chew on a slice of luck in Gameweek 8 when Aguero scored 5. Suffice to say I captained KdB which led to 97 points and a rise of almost 1 million in the overall rankings. This was meant to be the moment my season started. I should have seized on it but by Gameweek 12 I was ranked back at 1 millionth. The failure of hits from Gameweeks 9 to Gameweeks 11 only added salt to open wounds. Buying Mahrez and selling him made sense at the time when he was absent and made a no show. At least I had Vardy (even though I only captained him once). But the fact was that Leicester were unrelenting as was my fall. By now, I couldn’t afford to sit back and wait as I fell down my mini-leagues and the gap between my rivals opened up insurmountably – the wildcard was finally activated. Kane’s captain inspired 26 points were a much needed boost. The weekend after I managed to shoot up to 559k. But as autumn ended and winter began the slide recommenced. I was back to 1 millionth by Gameweek 18. My defiance of the template team (high ownership players) and template captains failed spectacularly. The turn of the year saw some green arrows (albeit with low scores). By now the chance of bagging a top 1% finish for five consecutive seasons was at serious risk. By Gameweek 25 I was back to 1 millionth. The yo-yoing of my rank was nothing but a frustration and a farce. By now, I realistically needed 13 consecutive green arrows if I was to finish in the top 1%. Inspiration came from Kane and Alli as Spurs became serious title contenders. Leicester’s goals dried up which made the Mahrez-Vardy combo less effective. Investing in Schmeichel helped as Leicester began racking up 1-0s. Making early changes on the aforementioned fronts helped me gain some lost ground. From Gameweek 26 to Gameweek 32 I only saw one red and steadily rose up by 600k. All-out attack was used in Gameweek 31 when I had a depleted defence which meant no clean sheets were lost on the bench. I was ranked as high as 380k by Gameweek 32. But by Gameweek 33, looking at the state of my team (injuries and rotation risks) on the eve of Double Gameweek 34, I decided to wildcard when everyone else used the Triple Captain chip, rather than taking a -12/16 hit in Double Gameweek 34 and wildcarding on the eve of Double Gameweek 37. I still captained Sanchez and bagged 50 points from him with a score of 136. With hindsight I probably would have scored slightly more if I triple captained – but I didn’t mind. Gameweek 37 saw a -8 hit instead and I scored 100 points after my hit was factored in as I reached 229k in the penultimate Gameweek. Gameweek 38 summed up my season – full of promise but ended on a downer. I was hoping for one final push to get up to 99,999 but that wasn’t to be. The rearranged Manchester United v Bournemouth fixture gave me hope that Smalling could get a clean sheet (and a cheeky goal), but all that ended in the final minutes of the game as he scored an own goal which cemented a red arrow. Ironically he did get a clean sheet win (with a goal) on international duty for England – such is life for any FPL manager. On the plus side I finished 59th in Play Togga’s Perfect XI! Looking ahead I am looking to take an immediate break from FPL. I won’t be participating in the official “European Fantasy Football” game – I just want to enjoy the tournament. If I continue playing, tweeting and/or blogging next season I will certainly be doing things a lot differently. Remember this, if and when I quit FPL, I know that I would want to finish on a high which probably indicates that I can't quit just yet! A Top 1% finish has become all the more difficult with a million more FPL managers taking up the game over the last 4 years. In addition, managers have become more educated with nifty tools and apps that have allowed us all to make more informed choices. All the best. Have a good summer! Clean sheets are for defensive players only, 3 players from the same team would equal 3 cleansheets.